If you’re trying to conceive, you probably know that a thick uterine lining is crucial for implantation. And a diet that has enough protein is essential for getting your lining to its optimal thickness. To build the uterine lining necessary for implantation, you should be getting 50-60 mg of protein a day. Bone broth is a simple way to help you get this protein. It has loads of other benefits too, including being great for your immune system, digestion, joints, gut, and more. It’s not hard to make, and can be done very cheaply. 2 pounds (approx.) of raw or cooked bones: beef, lamb, pork, or chicken. Organic is best. You can buy bones separately at a butcher or market, or freeze and save bones left over from other cooking. If using raw bones, roasting them in the oven first provides extra flavor. Place the bones in a large stockpot. Add water, making sure everything is covered. Add the apple cider vinegar and let it sit for half an hour. Now add the vegetables and salt and bring to a low boil. Lower the heat and simmer, uncovered, for 5 minutes. Skim off any foam that rises to the top. Simmer, covered, for at least 19 hours, and up to 24. Add the garlic and herbs during the last 30 minutes. Strain the stock, discarding the bones and vegetables. 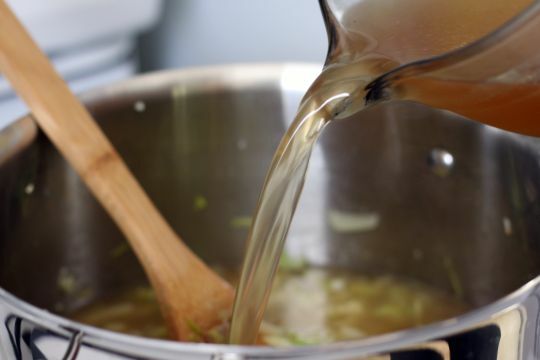 Chill the broth to room temperature, then store in the fridge for up to five days or freeze for later. Use your bone broth in soups, stews, sauces, rice, or drink it on its own for loads of protein goodness.